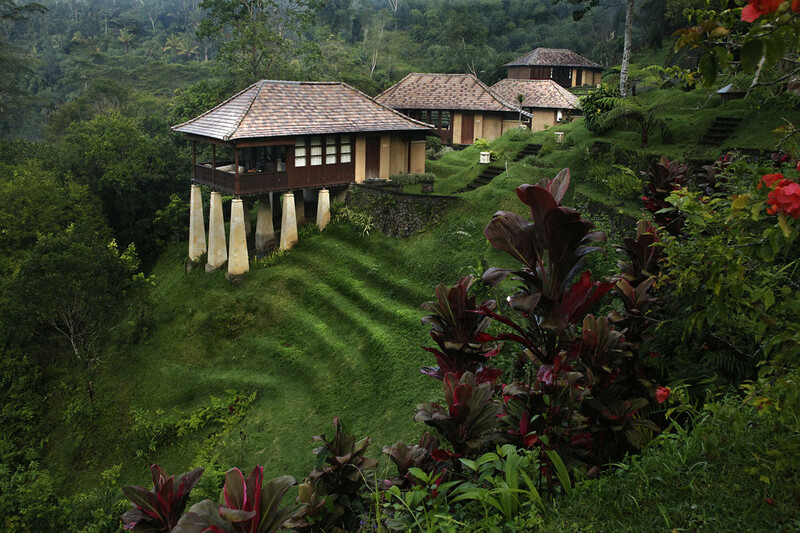 For those looking for a scenic and serene spot to indulge in soothing spa treatments, healing Ayurvedic therapies, and fresh organic fare, Bagus Jati is a world-class centre of holistic healing set amid a tropical rainforest. The resident experts here will work closely with you to design the perfect programme that makes use of a combination of ancient Indian and Chinese treatments, as well as exercise, nutritious menus and lifestyle coaching. In addition, throughout your stay you can relax and recharge in your own private luxury villa and explore the natural beauty of the resort and rural surroundings. Set on five sprawling hectares of verdant gardens and hills in the mountains just outside of Ubud, Bali’s centre of arts and culture, Bagus Jati is a picturesque and peaceful spot to escape from the stresses of day-to-day life. Interspersed throughout the grounds are striking villas spaced far enough apart to afford absolute privacy. 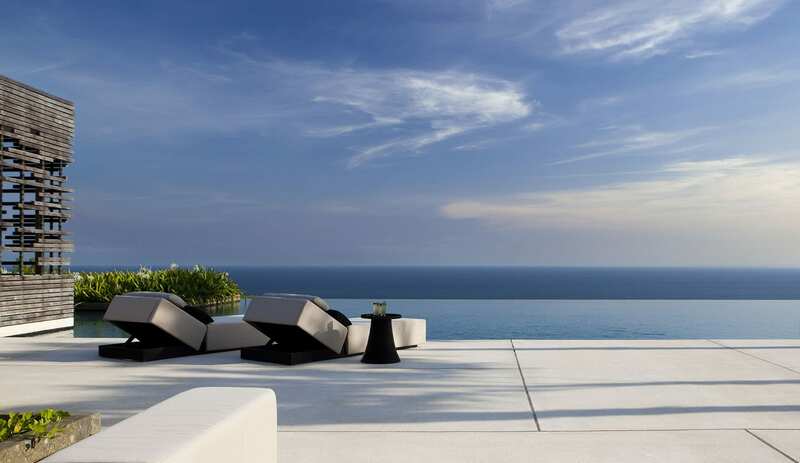 Also on site is a tranquil spa, two open-air yoga pavilions overlooking bamboo forests, an infinity pool set on the edge of a ravine, a fitness centre, organic garden, poolside cafe and a restaurant serving up nutritious cuisine. It’s all about rejuvenating the mind, body and soul at Bagus Jati with their range of programmes that help you find your perfect balance. The health and wellness packages here focus on holistic healing and detoxifying with a mix of natural Ayurvedic therapies, yoga sessions, traditional Asian-inspired spa treatments, and healthy organic fare made with ingredients fresh from their own garden. You can work one-on-one with their highly experienced team to design a programme that fits your specific needs and health goals, or choose from one of their excellent pre-planned packages. This programme is designed to eliminate harmful environmentally toxins built unconsciously in your system and help clear the build up of stress that we all encounter due to the hectic demands of daily life. Detox is the essential first step in establishing a pattern of wellbeing and vitality, a pattern that should become a way of life. Joining Daily Scheduled Activities (such as Nature Walk, “JAMU” introduction, Aqua Aerobics etc). Free use of our Health and Wellbeing facilities (Pool, Gym, Hot Jacuzzi in Spa). 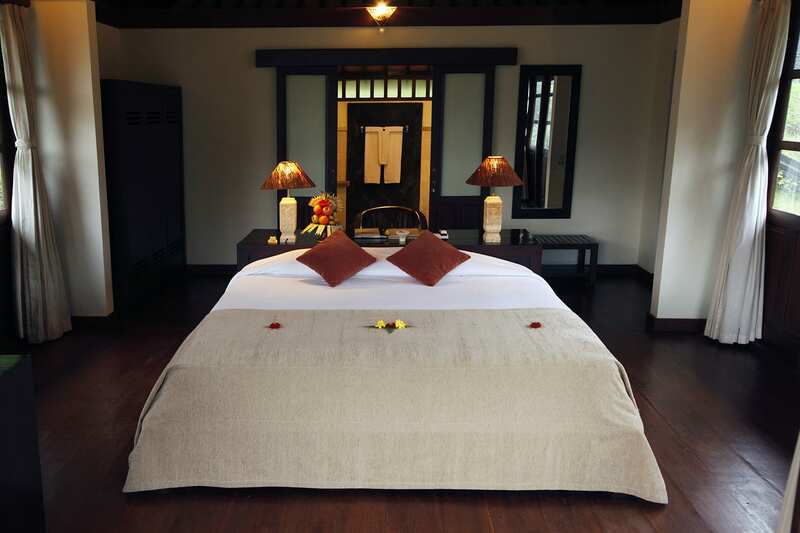 The above rates will increase by USD 30 per night from 1st August - 30th September. Enjoy a tranquil getaway from the hustle and bustle of every-day life, and prepare for some relaxing days of pampering and dining amidst the most beautiful tropical forest surroundings. Experience our different spa treatments and spoil your taste buds with delicious freshly prepared meals. Joining Daily Scheduled Activities (such as Nature Walk, Aqua Aerobics, “JAMU” introduction, Making “CANANG” and others). Free use of our Health and Well-being facilities (Pool, Gym, Hot Jacuzzi in Spa). Experience a combination of ancient Indian and Chinese treatments that make up the foundation of Indo chine traditional medicine. Enhance your daily nutrition, stress and life style issues by combining the enriching values of simple Yoga, exercise and diet with detoxifying treatments and lifestyle coaching. Return refreshed and rejuvenated with an easy to maintain daily program you can continue back home. Take this opportunity and spend several days high up in the mountains, surrounded by lush forest and allow the nurturing environment of Mother Nature help you break bad habits, learn new routines and experience spiritual awakenings while learning a whole new way of living. 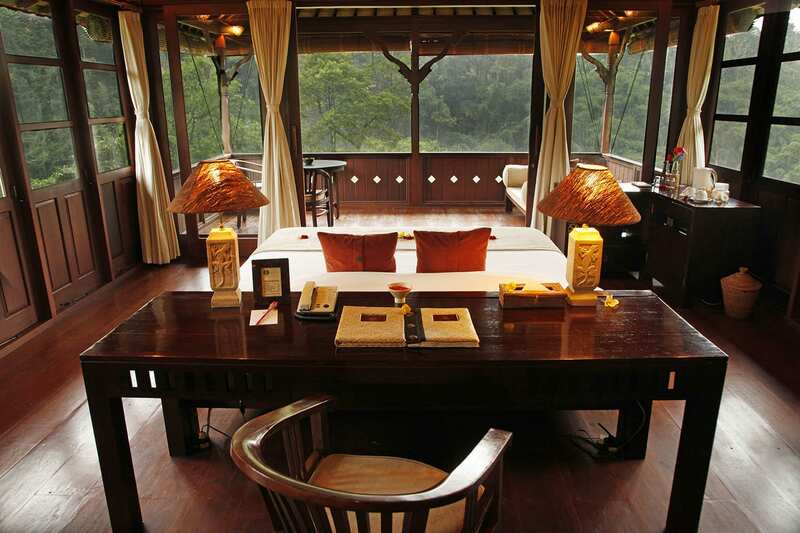 The villas at Bagus Jati are divided into 12 Superior Villas, 8 Deluxe Spa Villas, and two 2-Bedroom Pool Villas. Each villa is perfectly positioned to offer sweeping views of the mountains, valleys and forests from their own private verandas, and they are sufficiently spaced to allow for complete privacy. The villas are also set in a circular formation that follows the chakra concept of pure energy flow. The Superior Villas are 70 square meters and include a king or twin beds, large windows looking out over the natural surroundings, and ensuite bathrooms with large tubs and showers. Deluxe Spa Villas have king-sized beds, beautiful dressing rooms, and huge bathrooms with Jacuzzi tubs and spa facilities. The 2-Bedroom Pool Villas are the most spacious and luxurious as they each have two airy bedrooms, a large living room with home theatre facilities, and a private pool fronting the villa. 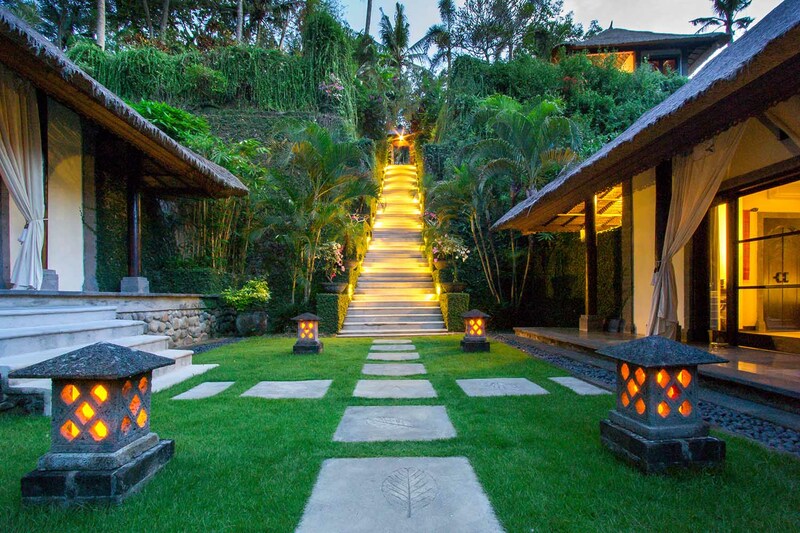 The Spa by Sejati Spa was designed with Balinese temple architecture in mind, and it features a sweeping staircase that leads to individual spa rooms each with their own tranquil water garden or views out over the jungle landscape. Here you can indulge in a range of treatments that make use of ancient healing techniques and organic spa products made in house with fruits, vegetables, herbs and flowers from the organic garden on site. 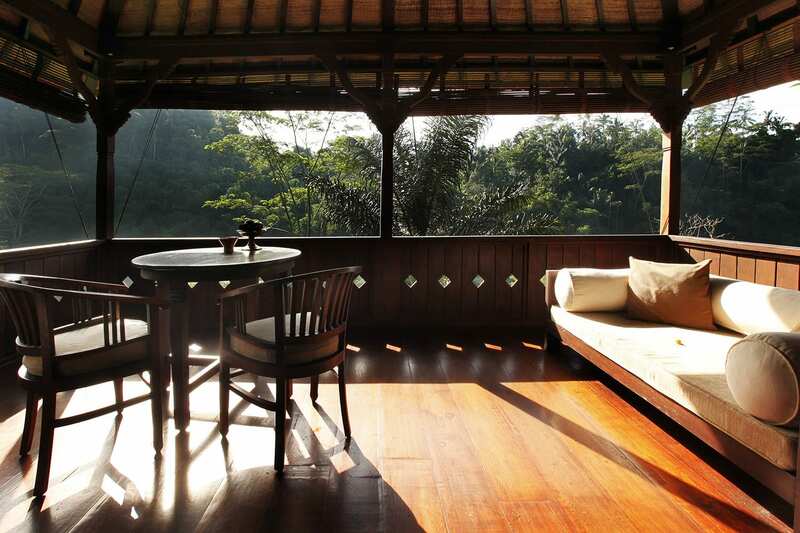 For spectacular views of the treetops, gardens and Mount Agung in the distance, plus fresh cuisine made with organic vegetables, fruits, herbs and spices procured from Bagus Jati’s organic garden, head to Surya Restaurant & Bar and snag a seat next to the huge windows or out on the wooden terrace. 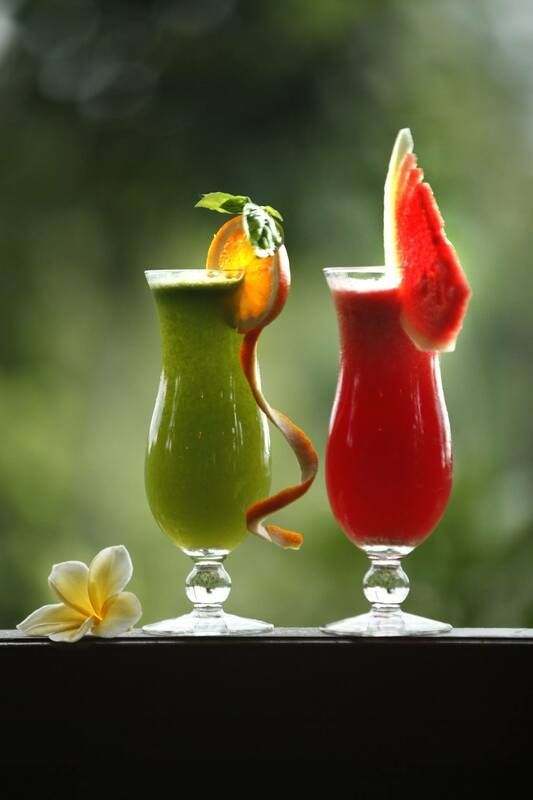 The menu here consists of Indonesian and international dishes accompanied by refreshing fruits juices and fine wines. The chefs here can also accommodate all types of diets and special needs including vegan and vegetarian, weight-loss, detox and digestive disorders. For leisurely lunches, cocktails or snacks by the pool, Iswan Poolside Cafe is a lovely spot to soak up the views and the tropical lifestyle. Here you can grab light bites during the day and sip and socialise during afternoon teas or over a sunset cocktail session. All guests at Bagus Jati are invited to join in the many activities that are on offer every day. These include morning yoga classes, nature walks, afternoon meditation sessions, Balinese dance lessons, aqua aerobics classes, and workshops on making Balinese offerings, spa products and jamu (traditional Indonesian natural medicines). Optional activities include Balinese cooking classes, jungle treks, village cycling tours, Mount Batur sunrise treks, tours to holy spring temples, and Balinese purification ceremonies. The resort also offers a free shuttle service into Ubud so you can explore the art galleries, temples, shops and restaurants around town. 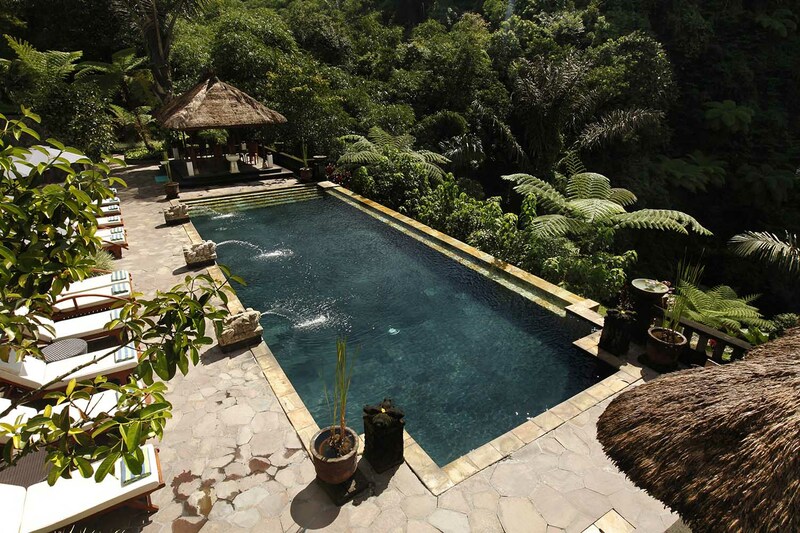 Bagus Jati is located in the mountains just 20 kilometres north of central Ubud. Its lush jungle setting makes it a scenic and serene spot to enjoy the natural beauty of the area, and it is close to a number of Bali’s best attractions like the famous rice terraces of Tegallalang, the majestic volcanic crater and lakes of Mount Batur, and of course all that Ubud has to offer. Absolutely loved this retreat in Bali! It is absolutely beautiful. Room is so amazing with incredibly views, lots of space, great shower and huge bathtub and patio. Luxurious accommodations. Spa was incredible. Easy to book services daily. I had wonderful massages, facial, hair treatment, banana leaf wrap and pedicure. Pool is gorgeous and relaxing. Poolside tea is lovely. The restaurant is delicious and wine is very good as well. Breakfast was great, like having brunch daily. Staff were amazing, accommodate your every need. Would go back in a heartbeat. Highly recommend! Total and utter bliss and perfection! 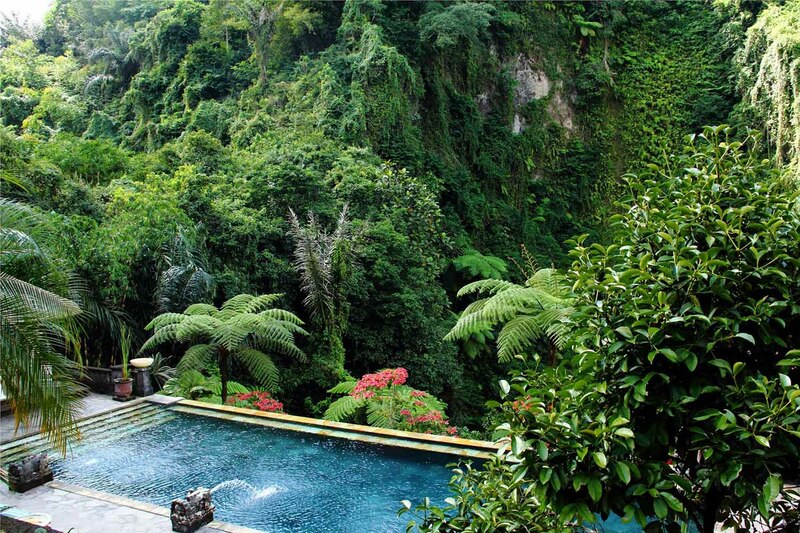 We fell in love with Bagus Jati; the gardens are lush, exquisite and expansive, with flower petals changed every day! We couldn't stop looking at and smelling all the beautiful flowers and trees. 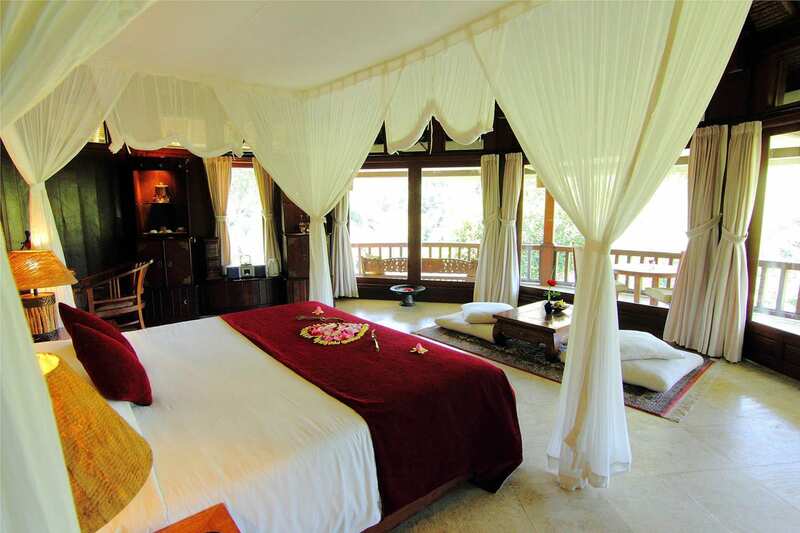 The accommodation villas are all on a hillside, overlooking a natural jungle, and waterfall area, with the beautiful pool and day spa area at the bottom of the hill on the jungle. 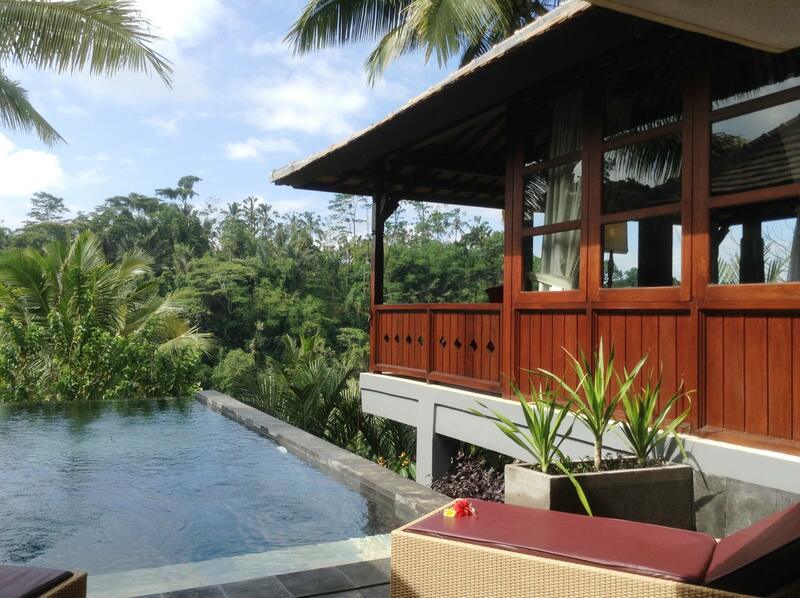 The location is about 25 mins north out of Ubud centre, next to little villages and near the famous rice terraces. The staff, facilities, food are exceptional. The staff were very accommodating, nothing at all is too difficult. 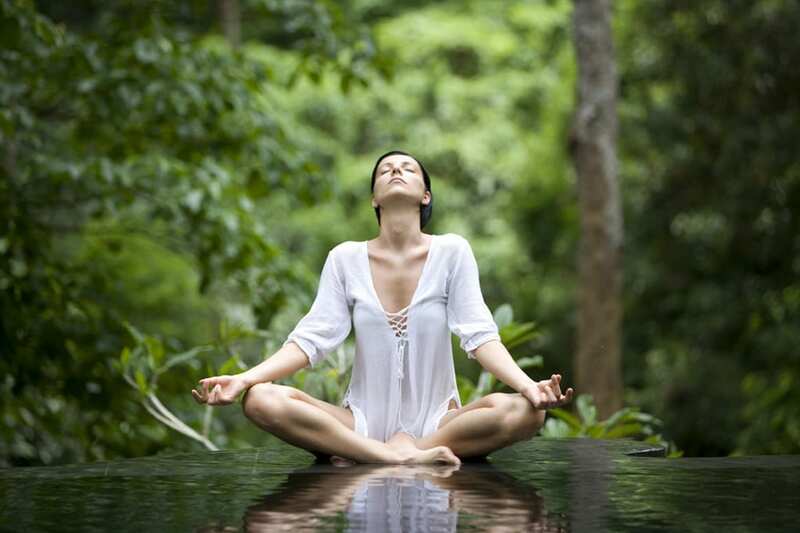 The yoga and meditation instructors were excellent, with the yoga facility possessing views of the jungle. We loved the staff at the restaurant. Heck, we loved everything. We cannot fault this accommodation, and we cannot wait to come back again! This place is incredible! Words can not describe what a healing place this is. We are having a hard time wanting to ever leave! 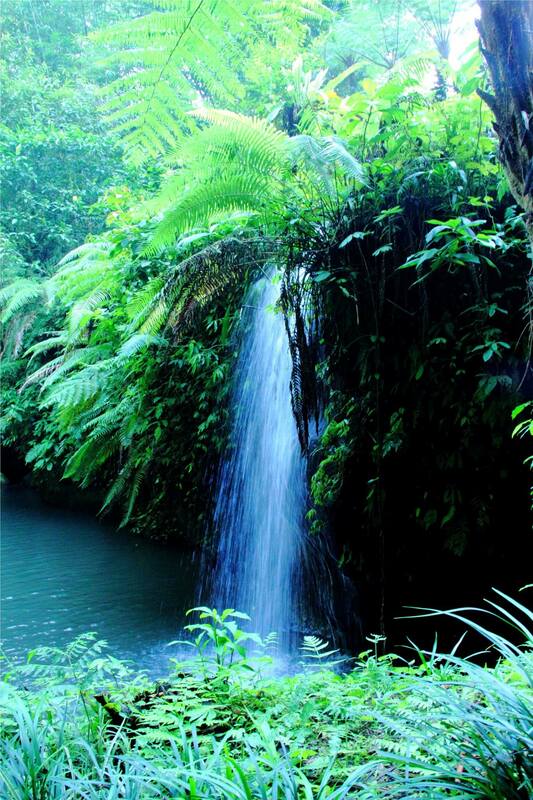 You must experience Bagus Jati if you are looking for a peaceful, remote, jungle get away while staying in Bali. The staff are excellent. We have never met a kinder group of people. While here, check out the guided walk with Buddha - he is fabulous and super energetic. We loved all of the spa staff and particularly enjoyed the deep tissue work from Tinni. All were so helpful and eager to please and support our wellness. The room service was super and we enjoyed delicious healthy meals in our room each day and the restaurant was great in the mornings. Such a healthy vibe if you want it, but there are other options too which made my husband very happy. If you book, ask for Ari and or Wayan. The manager is awesome his name is Nyoman, They were super helpful to us. We hope to come back again very soon. Blessings to all of the staff at Bagus Jati and many thanks for a most memorable experience. Oh by the way, our bungalow was sooooo beautiful and perfectly clean. The pool is natural and pristine and all of the grounds are gorgeous. This place is like heaven on earth! I have just spent 5 nights at this magnificent retreat. The surroundings are magical... Took my breath away. My villa was spacious, clean, comfortable.. Only complaint the pillows! The food was delicious.. Lots of choices and service at restaurant was exceptional. Yoga in the mornings led by Q were the perfect way to start and meditation in the afternoon led by Buddha the perfect way to end the day. The treatments were so good, I could not wait for my next one. Every staff member should be highly commended for their professionalism. They were a pleasure to be around. I loved my time here and cannot wait to come back. Highly professional health care from friendly and efficient staff in surpassingly beautiful surroundings. Our stay was many weeks ago now but stays with us as very memorable. We took a detox that has allowed us to make painless changes to our lifestyle whose benefits we think will be permanent. We also intend to return again, not only for the benefits to our health, but for the friendliness of the staff and the beauty of the setting, which includes the wider surroundings of this fertile, mountainous, unusual landscape and its vibrant local villages. The detox itself was efficiently organised and never allowed us to be hungry, though when we ate regular food in the restaurant which grows its own produce, we learned what we were missing. 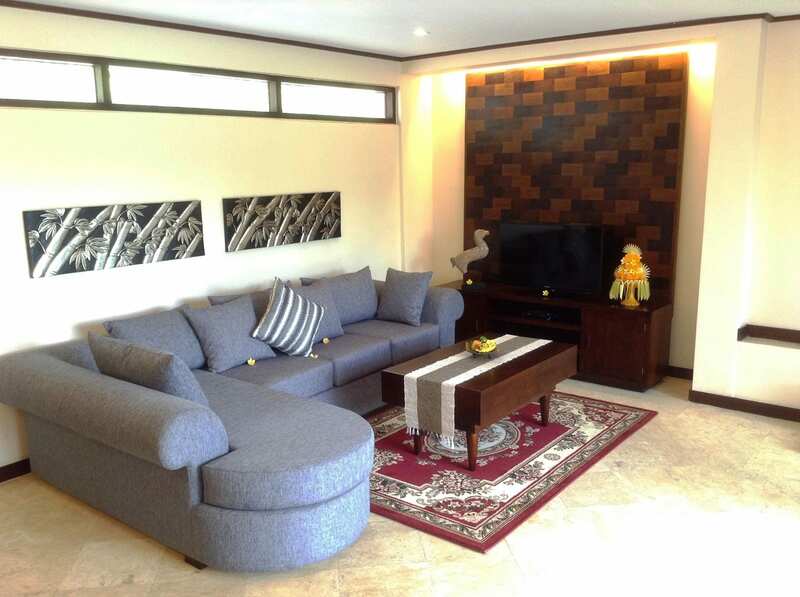 The villas are spacious and very well appointed and looked after. They are far enough away from each other to be peaceful, yet the beautiful spaces of the spa and the swimming pool are a place of congregation. The yoga teachers are excellent and with the massages, beauty treatment and free spa are an excellent complement to the detox. The wild mountain side that the resort looks onto would make a visit worthwhile without a detox. There are also excellent treks and cycle rides and other activities to keep one amused. This is a very worthwhile institution that strives to do good to its customers and the benefits are such that it is a pleasure to support its working community. I spent five nights in October on their yoga and Ayurvedic retreat and didn't want to leave! 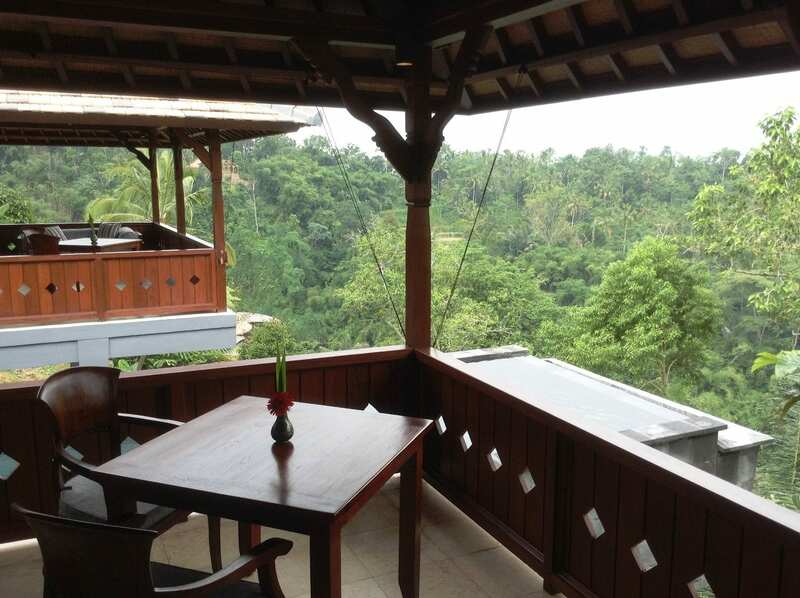 If you're looking for total relaxation in beautiful surroundings, looked after by genuinely warm and friendly Balinese staff then this is the spot. 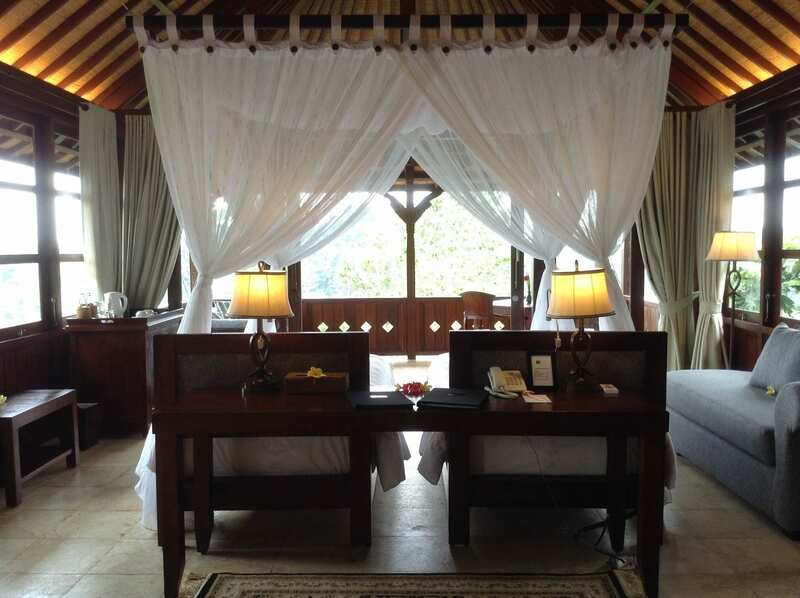 From the bungalow - love the day bed on verandah, to the spa treatments - the centre is stunning and the yoga classes - it's all excellent What can I say - just go! 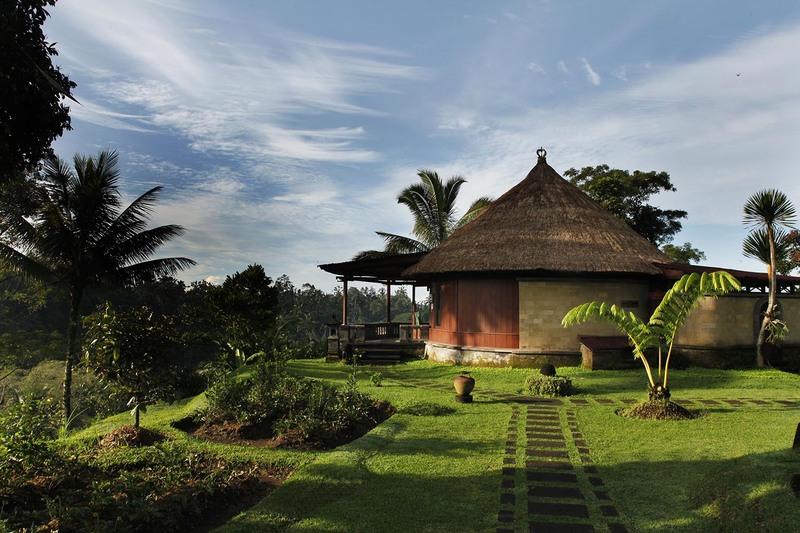 I spent five unforgettable nights at Bagus Jati enjoying my Yoga and Ayurvedic package. Upon check-in I was asked if it was OK if they upgraded me to a superior villa? I didn't protest and the big villa was well-designed, beautifully furnished and with fresh flowers all around. The Bagus Jati property is huge and again beauty and harmony is wherever you look; a little fountain here, a Hindu goddess there and tropical flowers all around. Architecture and well-designed gardens are all good, but Bagus Jati is really all about the people working there. Restaurant staff, masseuses, gardeners, drivers, yoga teachers and everyone else responsible for taking care of the property and its guest do their outmost to make your stay a experience of a lifetime. They're all genuine smiles with a true interest to help and answer questions about Bali, the property or anything else. I can truly recommend a body and soul week at Bagus Jati, You'll leave a happier and more grateful person than you ever were. I returned to Bagus Jati with students for my second yoga retreat and I didn't think it could get any better than last year, however I was wrong. Nyoman and Yuki went out of their way to make our stay comfortable and memorable. The staff, surroundings, the food, the service, all exceptional. Thank you Bagus Jati, you are one special place! Spent a week at Bagus Jati as a long standing Holiday plan with a friend. Neither of us knew what to expect. It was a first Bali experience and Health Spa type experience for both of us, and neither of us are under 21 but all I can say is Wow!!! !All the Staff were fantastic from the Reception to the girls in the Spa who made us feel great and the always happy, and very hard working gardening staff who tried to teach me Balinese. Food was fabulous, Cabins were great . The Buggy up the hill when I was feeling lazy was always there. There were Lots of Steps which didn't agree with my bad Knees so I found walking slowly up the Road easier They even made a Birthday cake for my Friend which meant she won't forget her Bali Birthday .We did go to Ubud on the Shuttle to shop , that was fun. All together Great !! When we first arrived, I looked around and could hardly believe my eyes just how beautiful this place really is. Photos on the internet simply do not do it justice. However, it just got better from there. The villas are beautiful, private and utterly amazing and beautifully styled and clean. The food was incredible....a rare combination of being healthy and delicious at the same time. Who knew you could eat tofu and spinach for breakfast and it could taste SO GOOD!! But what really blew us away was the staff. They were so interesting, kind and wonderful. I highly recommend the bike tour through the traditional villages. A Bagus Jati guide named Wayan gave us a private bike tour and it was so facinating. Its the kind of experience that I will treasure for the rest of my life. My only regret is that I had to leave. However, I will be going back there..I made that promise to myself as we drove off. If you are looking for breathtaking beauty, 6 star service, stunning accommodation, relaxation, great food and a cultural experience at the same time.....do not look further than this place. YOU WILL NOT BE DISAPPOINTED!!! I went there for 5 night Healing Spa Retreat. Where to start? The surroundings are spectacular, the villas are so beautiful (very spacious, facing the forest, not too close from each other to give you plenty of privacy), the facilities are simply g.o.r.g.e.o.u.s from the meditation room, the pool, the spa, the restaurant...being in the middle of the rainforest was so relaxing, and the food is delicious (you get many choices among the set menu for breakfast and dinner and everyday it was a real struggle to pick because everything tasted so good and so fresh). My stay really exceeded my expectations: I was looking for a place to relax and found a safe haven where I felt completely disconnected and so pampered. The spa treatments are the best i have ever had. The hotel offers all sorts of activities (some free) so you cant get bored. Some people will complain that it is difficult to get around because it is all built on very steep slopes but I found it to be a nice walk - it's true you need to be fit - and you can always take the club car if you don't want or can't walk. Now I saved the best for last: the staff. They are so friendly, so warm and smiling and will always go out of their way to please you - they really made me feel special and my stay even more magical. Cant recommend this place enough!!! 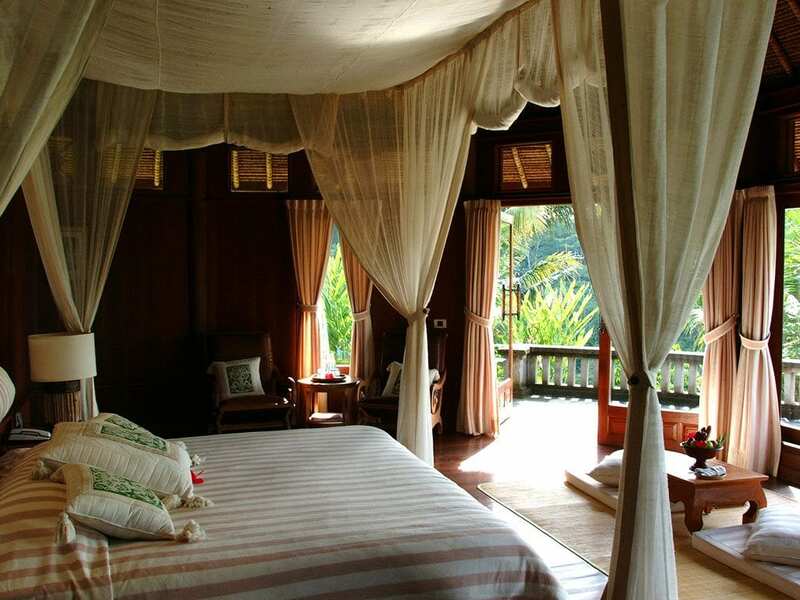 Bagus Jati is the best place if you need a getaway from the stressful daily life and to heal your body and soul. Wish I had more time to stay there. I loved everything - waking up with the amazing nature view and sounds of nature, the morning yoga, healthy, tasty and rich food, friendly staff, comfortable and spacious room, the cooking class or other activities, such as cycling or cooking class. The spa is great with variety of treatments with natural products that make you feel fresh and rejuvenated. Would love to go back there anytime. I booked a 5 night Healing Package and it was amazing! The grounds are beautiful, the food is very healthy, the staff are very friendly and will do anything to assist. I was a bit hesitant as I thought I would be bored at night considering the location of the hotel, but I wasn't. I was up early for Yoga at 7.30am every morning and after various activities and spa treatments I didn't need to stay up too late after dinner! I went on the bike ride and did the cooking class (you don't cook that much) - it was fun to interact with the locals. Food is made with the freshest organic ingredients grown on the grounds or on other land owned by the hotel. I also utilised the courtesy bus to Ubud - I wanted to get back to the hotel, Ubud was too chaotic! All my spa treatments were fantastic, the girls in the spa work so hard and are always smiling. The villa was beautiful with a huge balcony overlooking the jungle. It is very safe. I left feeling relaxed, healthy and re-energised. Yes it is hilly and there are stairs but it's not that bad and just think of all the calories you burn walking up and down the grounds. It is nearly a 2 hour drive from the airport, just be prepared but it's definitely worth it. I would recommend this hotel to all! My husband and I stayed at Bagus Jati for five days and arrived after an 18 hour journey in the middle of the night. Though we couldn't see much other than the lights dotted around the property, we knew we had come to stay somewhere very special. The villa was incredible. Spacious, modern and I loved that there were no tv's to distract you. Waking up that first morning, was magical. Bagus Jati has an energy which will make time feel like its stopped but there is always something to do. Yoga and meditation were fantastic, well catered for beginners and experienced yogis alike. The five days felt like a month and we were sad about leaving. Food is incredible and they cater for those who wish to cleanse (me) and those who have tagged along and love to indulge (my husband). We both still dream about the place and can't wait to go back. Have nothing remotely negative to say at all, one of my favourite places on earth. I just returned from a 14 day retreat at Bagus Jati and highly recommend to anyone looking for a very relaxing, healthy Balinese experience. The resort was breathtaking, the staff super accommodating and friendly. Yoga and meditation classes were set in the most jaw dropping environment, views of jungle and wildlife with just as amazing instructors. Food and Spa treatments were also to die for and the daily activities made sure there was always something to do or see if need be. I have returned home fitter, healthier and happy. I very much look forward to my next visit.. This is a place to dream about going if you like beauty and tranquility. It is totally relaxing and chilled. The food is delicious, the staff are genuinely delightful and helpful and do everything they can to create harmony and peace for their guests. The grounds are beautifully landscaped and maintained and everything is planned to enhance the natural beauty and ambience of the surrounding rainforest. 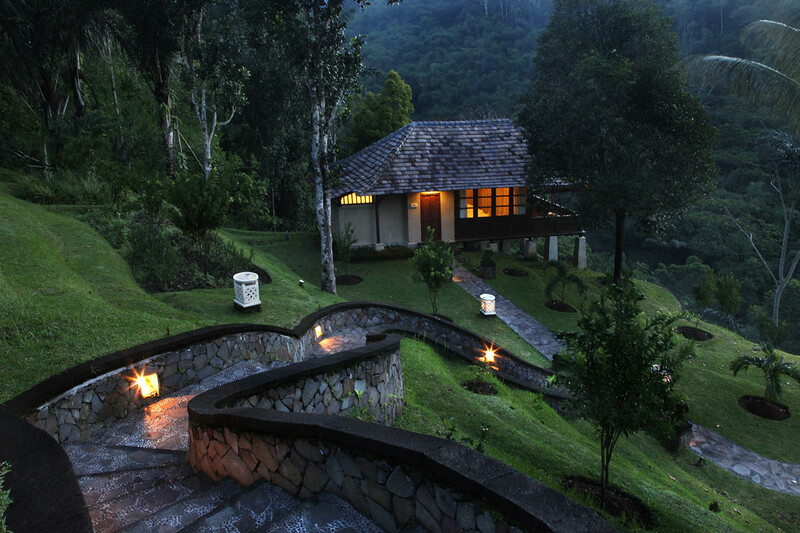 For a complete retreat from the rat race, go to bagus jati and rejuvenate. The setting of Bagus Jati is amazing. Facing the jungle and feeling direct contact with nature, it is the perfect place to get lost and reconnect with your inner self. I have stayed a couple of times. Last time was to celebrate my husband's birthday. Since we went out for dinner and arrive late to the room, they Waited and came in the middle of the night with a yummy birthday cake. Their spa offers a great range of treatments and all guests can enjoy the jacuzzi, sauna and the pool. 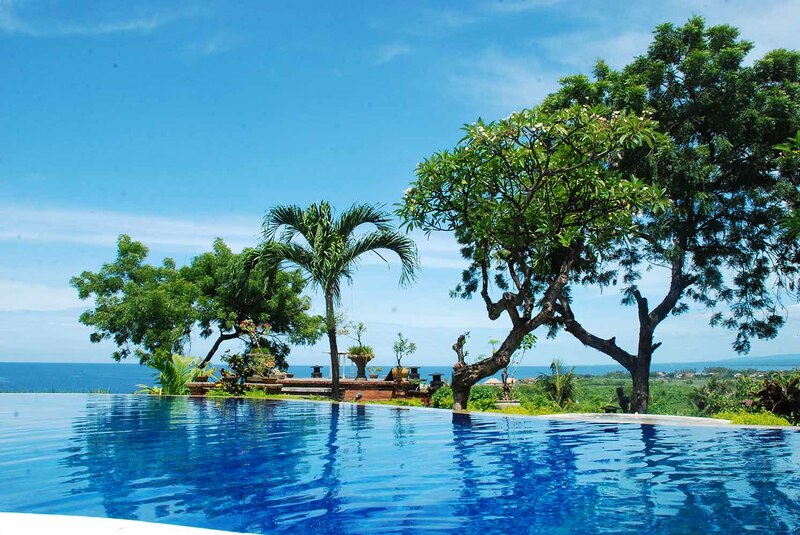 They have daily scheduled activities like yoga, meditation, jamu class, aqua aerobic and more free for guests. There is not TV, just the sound of jungle. But if you need some action, can take their free shuttle to Ubud town just 30 minutes away, where there are many shops, restaurants and sort of activities. Highly recommended for couples in love and those willing to re-connect and relax. Set amidst rice paddies and lush jungle, Sukhavati Ayurvedic Retreat & Spa is a world-class luxury health and wellness retreat that specialises in Ayurvedic healing therapies to heal, rest, recover and regenerate your mind, body and soul. Consistently ranking as one of the top ten hotels in Bali, Alila Villas Uluwatu is now offering a divine all inclusive Pampering & Wellness package exclusive to Ultimate Bali guests. For those looking to relax & recharge in a truly inspirational setting. 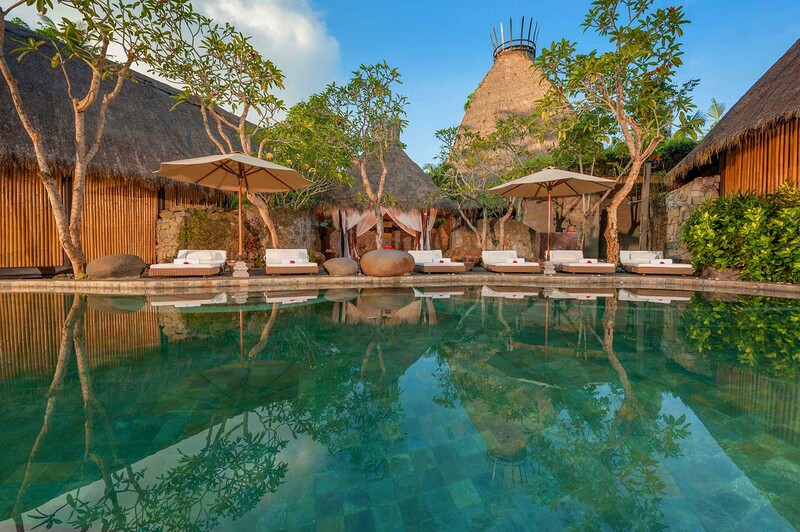 Nestled alongside the Ayung River, Fivelements, Puri Ahimsa is Bali's award-winning eco-conscious luxury wellness retreat deeply rooted in the island’s ancient traditions, nurturing harmony among spirit, human and nature. 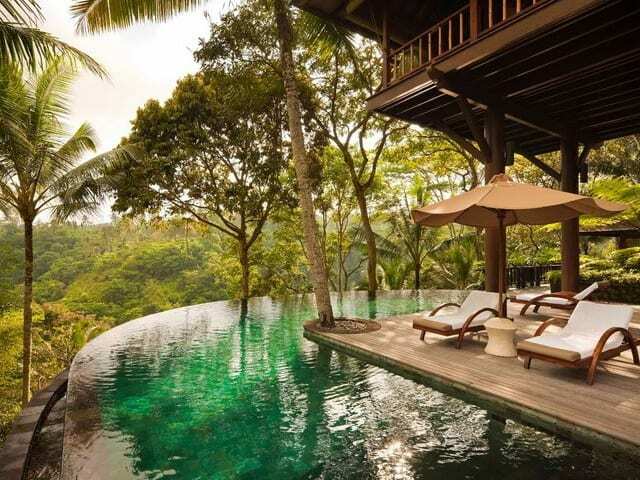 One of the top luxury destinations spas in the world, the multi-award winning Como Shambhala Estate is a unique residential health retreat set in a tropical 9-hectare estate on the banks of the Ayung River 10 km from the town of Ubud. Overlooking the Sea of Bali, nestled in tropical gardens and surrounded by nature, is Zen Resort Bali - a holistic and wellness retreat to relax and rejuvenate your physical, psychological and spiritual wellness. 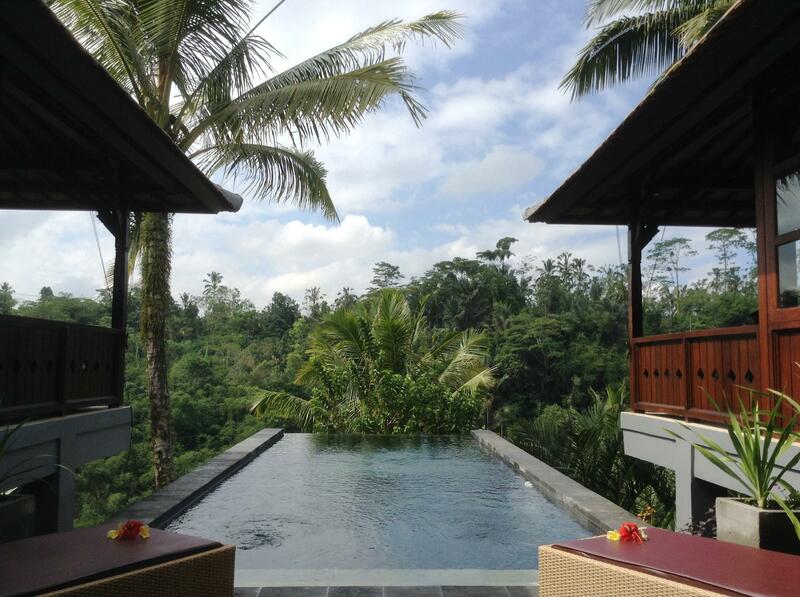 Bali Vitality is a boutique personalised health retreat specialist that offers a range of solutions including stress release, improved emotional well-being, detoxification, alleviation of bodily pain and assistance in weight loss.